Mr. James “Jim” C. Stringfellow, a resident of Ft. Valley, GA, and native of Mobile, AL, passed away Friday, February 4, 2011, at his residence. He was 48 years young and had been bravely fighting cancer since August 2010. Mr. Stringfellow is survived by his loving wife Heike Stringfellow of Ft. Valley, GA; one daughter, Elizabeth Stringfellow of Mobile, AL; two step-sons, Marcus Dusold and Kevin Howell, both of Ft. Valley, GA; three sisters, Lanice Curts and Elizabeth Calametti of Mobile, AL, and Sandra Macey of Denver, CO; two grand children, nieces, nephews, and many loving and devoted friends. Jim loved riding his Harley with his wife, Heike, along with other friends and members of the Southern Cruisers Motorcycle Club. He was a great cook and entertainer, and often enjoyed having his family and friends over for backyard BBQs. An amateur musician, Jim was a member of the Knee Deep band, who recently recorded their first single “POW/MIA – You’re Not Forgotten." Jim was kind, giving, always ready to lend a helping hand to anyone in need, and a faithful Christian. Jim will be missed by all who knew him, and by his devoted dogs Duckie and Zeva. There will be a memorial motorcycle ride for Jim, details to be announced at a later time. In lieu of flowers, memorials may be made directed to the family at P.O. Box 384, Ft. Valley, GA 31030. 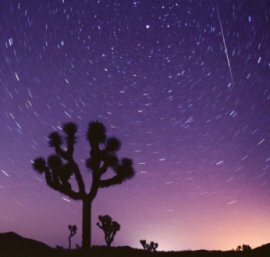 Mark your calendar: The 2008 Perseid meteor shower peaks on August 12th and NASA says it should be a good show. Serious meteor hunters should begin their watch early on Monday evening, August 11th, around 9 p.m. CST (when Perseus first rises in the northeast). This is the time to look for Perseid Earthgrazers - meteors that approach from the horizon and skim the atmosphere overhead. For maximum effect, get away from city lights! 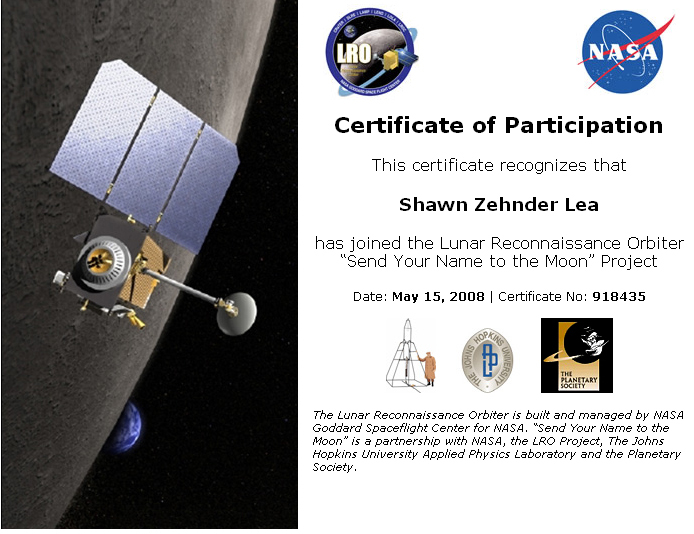 NASA invites people of all ages to join the lunar exploration journey with an opportunity to send their names to the moon aboard the Lunar Reconnaissance Orbiter, or LRO, spacecraft. The Send Your Name to the Moon Web site enables everyone to participate in the lunar adventure and place their names in orbit around the moon for years to come. Participants can submit their information here, print a certificate and have their name entered into a database. 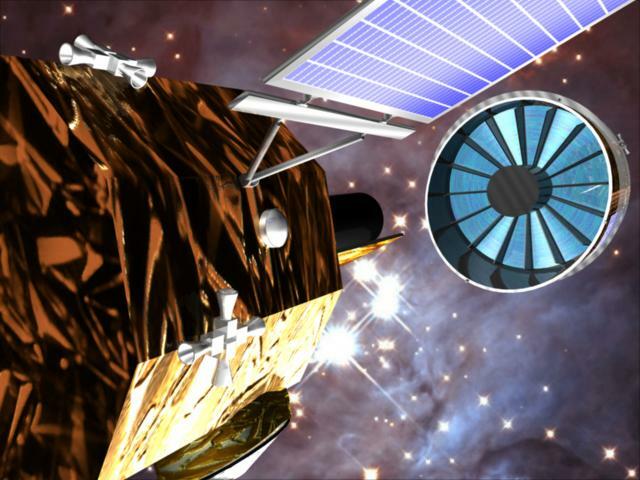 The database will be placed on a microchip that will be integrated onto the spacecraft. The deadline for submitting names is June 27, 2008. The Hubble Space Telescope has beamed spectacular images of faraway galaxies and stars to Earth since it was launched into orbit in 1990. Now, British scientists are developing the X-ray Evolving Universe Spectroscopy (XEUS), which will steal Hubble's title as the largest telescope in space when it's launched within the next 10 years. The University of Arizona's Mt. Graham International Observatory is home to the world's most powerful optical telescope, the Large Binocular Telescope. It can capture images of objects millions of light years away. The telescope consists of two 8.4-meter diameter mirrors that gather more light and have 10x the resolution of the Hubble Space Telescope. 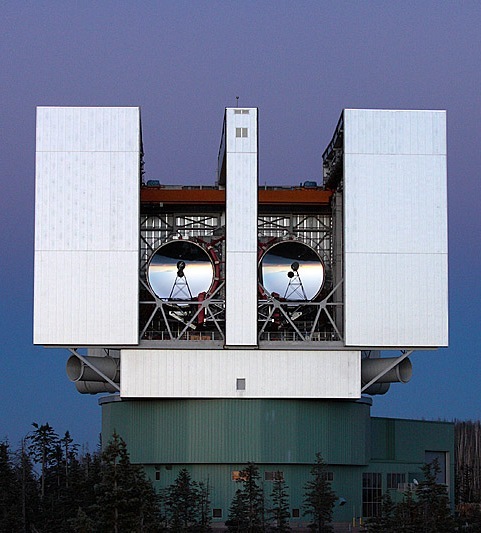 It's the third telescope on the 10,500-foot peak, joining the Heinrich-Hertz Submillimeter Telescope and the Vatican Advanced Technology Telescope. It took its first images using both mirrors last year and they were released to the public on March 6. 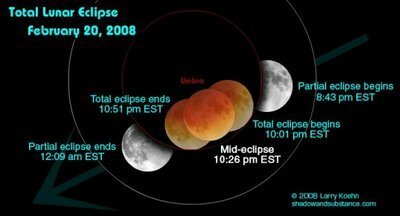 On Wednesday evening, February 20th, there will be a total lunar eclipse—the last one until Dec. 2010. Maximum eclipse - and maximum beauty - occurs at 10:26 pm EST (7:26 pm PST). International maps and timetables to view the eclipse are online here. NASA's Stennis Space Center is gearing up for its new role in the country's plans to return astronauts to the moon. NASA has unveiled which agency centers will take responsibility for specific work to enable lunar exploration. The new assignments cover elements of the lunar lander and lunar surface operations. The agency also announced work assignments for Ares V, a heavy-lift rocket for lunar missions. "Stennis is extremely proud of the role we have to play in the development of the propulsion systems that will return U.S. astronauts to the moon," says Bob Cabana, Stennis director. "With the current construction of the new A-3 test stand to support testing of the J2-X engine for the Ares rockets, along with the future work for the Ares V and lunar lander recently assigned to Stennis, our position as a leader in rocket propulsion test and development is secure for the future. We look forward to the challenge and to being a key member of the Constellation team." Responsibilities assigned to Stennis include leading Ares V liquid rocket systems and stage testing at sea level and altitude and support of lunar lander descent stage propulsion testing. In addition to the new work assignments, Constellation Program work previously assigned to Stennis includes a number of efforts in the area of program integration and ground operations. The Ares V and lunar lander assignments will ramp up in fiscal year 2011, with surface system assignments in fiscal year 2012. While these decisions will result in budget and personnel allocations at the centers, detailed estimates will not be available until after prime contractors are formally selected for the work. Each center will have the opportunity for additional work assignments as Constellation Program elements become further defined. NASA's Constellation Program is working to send astronauts to the moon, where they plan to set up a lunar outpost to prepare for human exploration further into the solar system. The first crewed flight of the Orion spacecraft, aboard an Ares I rocket, is scheduled for no later than 2015. Astronauts will return to the moon by 2020. Digital Universe Atlas is a project to create a "new network of portals designed to provide high-quality information and services to the public". Contributors are to be both experts and the public. The project is an attempt by scientists, astronomers and artists around the globe to map space - star by star and galaxy by galaxy. 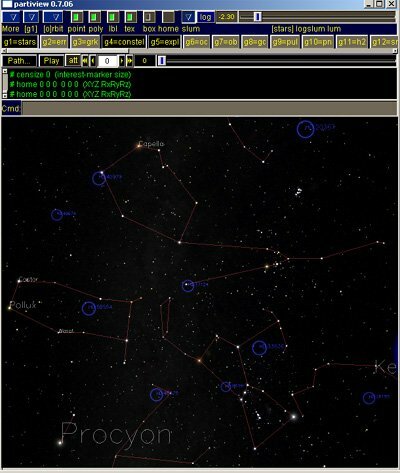 With a free software download, anyone can explore the universe and see what Earth looks like from light-years away. "It's the Geminid meteor shower," says NASA astronomer Bill Cooke of the Marshall Space Flight Center. "Start watching on Thursday evening, Dec. 13th, around 10 pm local time," he advises. "At first you might not see very many meteors—but be patient. 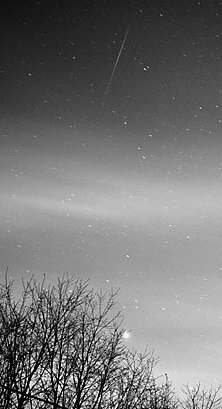 The show really heats up after midnight and by dawn on Friday, Dec. 14th, there could be dozens of bright meteors per hour streaking across the sky." For more from NASA, click here. Google will award $30 million to the first private team to put a robot on the moon, the company and the X Prize Foundation announced at Wired NextFest in Los Angeles on Sept. 13. Members of the public will also get the chance to send digital mementos to the moon. In this advance from the October issue of Wired magazine, contributing editor Spencer Reiss explains what's behind the Google Lunar X Prize, and what it will take to win it.